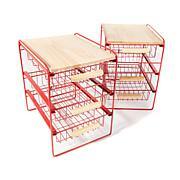 Store your supplies in smoke-colored style. 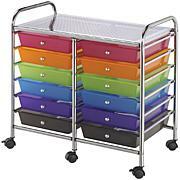 This rolling cart is ideal for storing large and small tools, embellishments, punches, stamps, paper and more. The plastic work surface gives you space to get crafty when creativity calls. 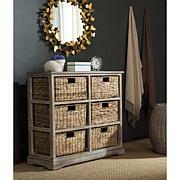 Great little storage cabinet. Just what I needed to keep a lot of misc. items in. 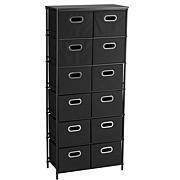 Easy for me to put together, and I have no technical skills when it comes to assembling ANYTHING. It took me 20-25 mins, and had easy to understand instructions. I use this as a my "current every day makeup" that sits beside my full vanity. 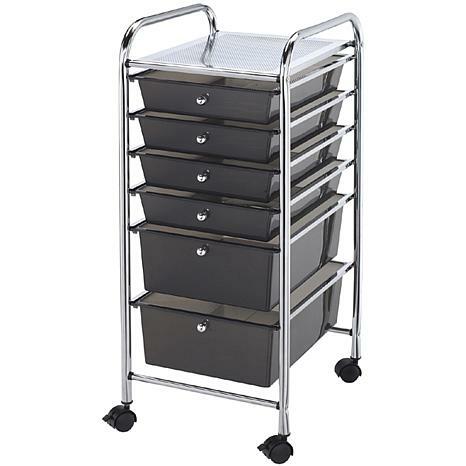 This makes it easy to change out my makeup from my vanity so I don't forget I have stuff. Sturdy enough for what I have in it, but I don't have a lot in it. It may not be sturdy enough if objects are on the heavy side. I like the rolling casters for easy transfer of the cart. Nice addition to tidy up my makeup vanity. I like my new storage cart. I Love that it has a metal top. Allows me to use as a work station, like to keep one of my many scrapbooking devices. The drawers hold various supplies & tools. My husband put it together for me in a few minutes. The smoke drawers go with any decor. I am glad I purchased this storage cart.